Paddling is as much a recreational activity and fitness sport as a competitive discipline, but in the sport of adventure racing it has not achieved the priority of the land-based activities of trail running and mountain biking. Yet paddling is one of the four key disciplines (map-and-compass navigation being the fourth) and it is integral to this multi-discipline sport. When it comes to paddling, the range of kayaks available is extensive and the type of kayak that features in a race depends on the event’s location, duration and time of year. Teams may find themselves on dams, lakes, rivers (flatwater or whitewater), seas and canals; and they may have to paddle racing kayaks, sea kayaks, surfskis, plastic sit-on-tops, dug-out canoes, bamboo rafts, traditional boats and inflatable rafts (two-man or bigger). An event could include more than one type of paddling setup. For a discipline that is very neglected in training, a significant amount of time could be spent on the water and hours may be gained or lost in the race. Nicholas Mulder, founder and navigator of one of South Africa’s most successful teams – Team Cyanosis – says, “It is important to be an all-rounder in your paddling skills for adventure racing. Races can throw anything at you and courses can incorporate any flatwater, river or ocean paddling. You need to be comfortable in as many different situations as possible”. Compared to running, which you can do from your doorstep, paddling is like making pasta from scratch. Until you’re kitted with a PFD, paddle and kayak (or have a friend with a boat), and you have a watery location to paddle from, it is an activity that takes some effort. It definitely helps to live within a reasonable distance from a dam, a river, lagoon or the sea. You then need to be able to transport the boat on roof racks or to store it at a kayak club for easy access. Once these are sorted, paddling becomes as convenient and accessible as going mountain biking. Even if you’re heading to a coastal race with +40km of sea kayaking, paddling laps on Emmarentia Dam in Jo’burg is good training for paddling fitness and endurance. A trip to the coast – with an experienced seakayaker – will polish your preparations. To get ready for a race, begin paddling months (or at least weeks) in advance by paddling an appropriate kayak, like a sit-on-top that offers both stability and speed. Your initial learning curve will have a gentle gradient and you can focus on good form and building strength in your back and shoulders. There is absolutely no need to train in a fibreglass racing K1 if you will be paddling a plastic, double sit-on-top at the race. Some new sit-on-top designs offer stability and speed with feature-rich offerings so that your training is effective and not a slog. While a person can paddle with poor form, paddling is – like golf and tennis – a technical discipline where you benefit greatly from instruction by a coach. Learning a correct and efficient technique from the start,in a boat that is suited to your skill level, is essential. Paddling a boat that is above your ability will only cultivate poor technique and posture that will be hard to correct later. 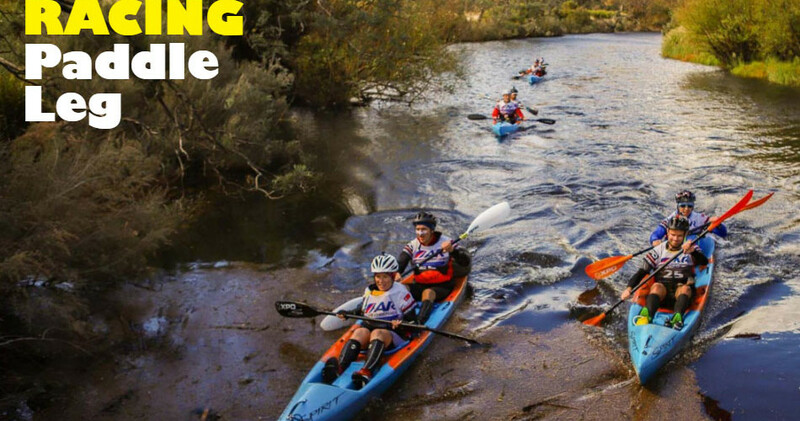 In adventure racing, the paddling style and cadence is different to that of say a K1 sprinter. A coach will be able to guide you to developing the most efficient style that will enable you to paddle for hours (and hours and hours). “Although improving your long-distance paddling endurance is always the goal, you need to have confidence in a wide-range of paddling environments,” says Mulder. Kayaks can be rented from kayak clubs or borrowed from friends. This gives you the opportunity to try many different types of kayaks. Demo Days presented by a kayak store allow you to try a number of kayaks in one sitting, together with advice on the right type of kayak to consider for your preferred activities. Buying your own kayak is the next step. What you do need to buy is your own paddle and PFD (personal flotation device aka ‘lifejacket’) as these are personal items, like running shoes and a backpack. Roof racks are also a necessity so that transporting the boat is not a limitation. You may need to transport your kayak to races and to take it on holiday with you. Designate at least one session a week to paddling; two would be better. The point of regular paddling is to develop technique (use your back, not your arms! ), upper body strength and water awareness. Time trials hosted by kayak clubs on dams or lagoons around South Africa are open to everyone. Start by paddling part of the distance until you have built-up your endurance to complete the full distance. These sessions are social and well attended, especially in summer. Canoe polo is a paddling discipline that is currently enjoying a growing interest and participation. Based from a number of paddling clubs, this fun kayak game hones paddling skills in an environment that is social, supportive and encouraging. Kayak triathlons are, sadly, few-and-far between, but they are brilliant fun if you can catch one. 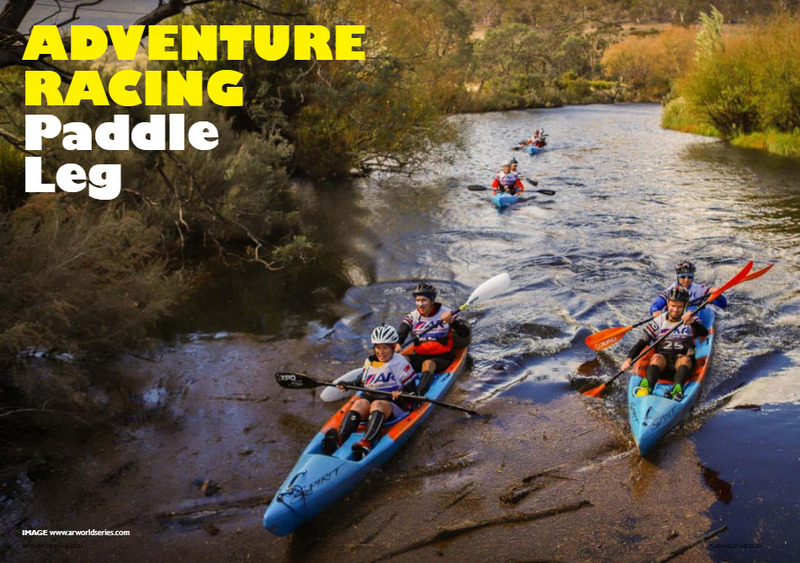 Some adventure races, like those presented by Kinetic Events, provide teams with double kayaks and paddles. Others, like the five-event A1 Adventure Racing Series, allow you to Bring Your Own Boat (BYOB). BYOB events may specify a length:width ratio, a kayak type or a maximum length to which kayaks must comply. The benefit of BYOB is that if a team puts effort into paddling, improves their skills and is able to paddle kayaks at the top of the specifications, they will paddle faster and thus gain time on their competitors. For a country with great weather, nine-months of summer (at least! ), a massive coastline, hundreds of dams (even in cities) and accessible rivers that are suitable for non-technical paddling, this discipline has been neglected by adventure racers for too long.Purchase your own kayak and makeuse of accessible waterways and events, to increase your opportunities to effortlessly incorporate paddling into a multi-discipline training schedule. Written by Lisa de Speville. A version of this article first appeared in the Nov/Dec 2010 issue (14.3) of Go Multi Magazine. It was updated and edited for January 2019 issue of The Paddle Mag. This free digital publication can be read online or downloaded to be enjoyed later on your device.